We often have to extract from this type of files a certain subset of columns of interest, ignoring the others. This kind of operation can easily be performed on unix-like systems using shell commands. 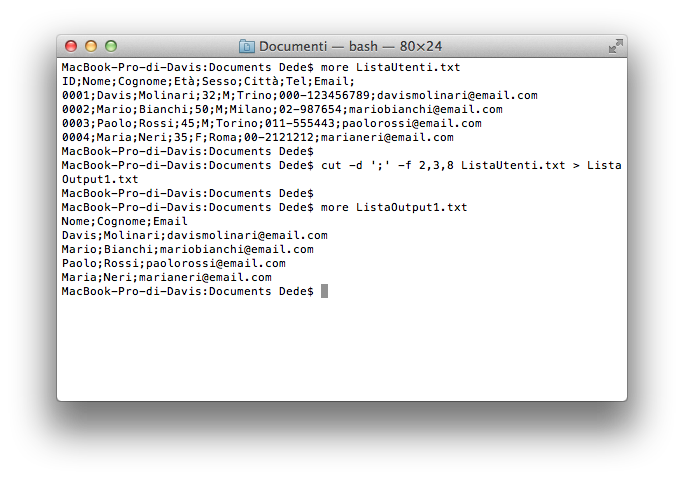 Our file has a first header row and then the rows that contain the anagrafic and contact user information. In each line the various elements are divided by a separator character which in this case is represented by ‘;’ (semicolon). Now suppose we want to extract from the original file only a few columns, such as columns “Name”, “LastName” and “Email” and save the new subset of data to a new file. We can easily obtain this result with the cut command. This command allows us to specify, using the -d option, the delimiter that separates the fields of our lines and, using the -f option, the indexes of the columns we want to extract. 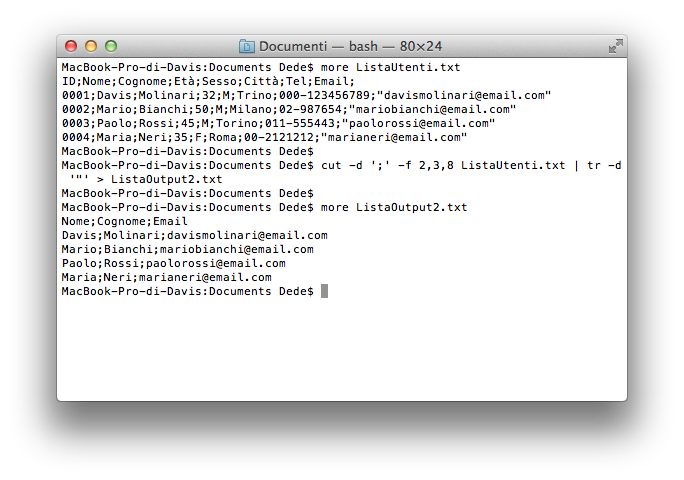 The column indixes start with 1, so to obtain our goal we have to extract the columns 2 (Name), 3 (LastName) and 8 (Email). As we can see from the previous image the file created with the command contains exactly the extract of the data we wanted. Now let’s add some other operation. What we want to do is get the same output as before, so this time as well as select the columns of interest we must remove the quotation marks from the values of the Email column. To do this we use the command tr (translate characters) with the -d option, with which we indicate to delete characters that we provide. 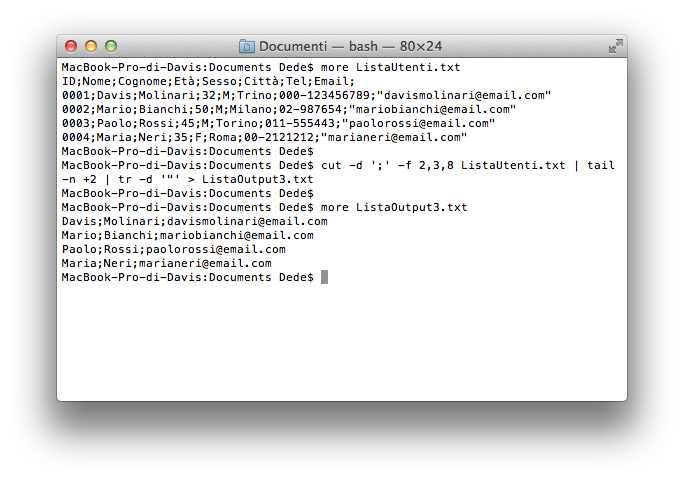 We’ll provide to tr command the output of our cut command through the ‘|’ (Pipe). From the image above we can see that the content is equal to the previous one and we have eliminated the quotation marks that enclosed values of the email column. Finally we add a further refinement. Typically this type of file has a first header line that lists the names of the columns that the values of the following lines correspond to. Often we need to eliminate this header line. And it is precisely the latter option that is right for us! As we can see from the picture we get the desired result because we have eliminated both the header row and the quotes. This entry was posted in Bash, Programming and tagged Linux, Shell, Unix. Bookmark the permalink.